"I can't even put it into words," Solinsky said haltingly. "You know, I don't know. It still hasn't sunk in what I just ran because, honestly, we come in here hearing all about Galen was going to make a record. We just wanted to come in and have a fast race." 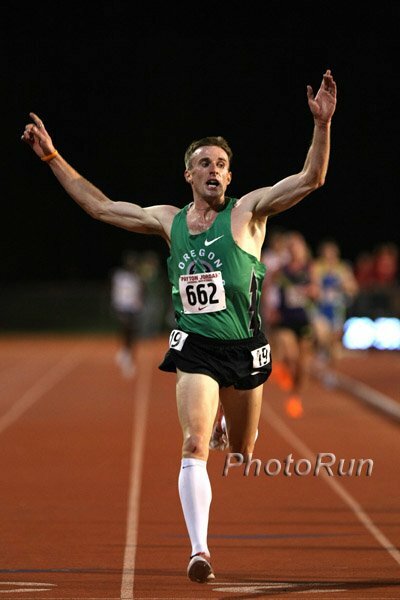 - Chris Solinsky after setting the American 10,000 record Saturday night at Stanford. Solinsky got the win, the American record, and the first sub-27 clocking by a white guy in his 10k debut. Bolt 19.56, Gay 45.05 Bolt is so good now that he runs 19.56 into the wind and more people are talking about Gay running 45.05. Texas Governor Carries Laser-Sighted Pistol While Running Gov. Rick Perry, who is running for re-election, says the pistol is for snakes, and reportedly killed a coyote. If you've ever run with a gun, email us at [email protected]. This week, we crown the new king and queen of marathoning, heap praise on Andrew Wheating and the men of Oregon, talk about LaShawn Merritt's package, praise Ryan Hall's amazing consistency and wonder whether Deena Kastor will ever break 2:25 again. Rotterdam Marathon Releases Chart Showing Their Race Is Faster Than London Rotterdam should undoubtedly be a World Marathon Major, especially if Berlin is setting up the race for one runner every year. High Standards: England/India Tension Continues As Delhi Commonwealth Organizers Pledge Tight Security We can't all spend 100 billion pounds in taxpayer money on our contests. Off Year: Carnage In London - Wanjiru, Tadese, Kibet, Mikitenko, Kastor, Yamauchi Fade And/Or Drop Volcanic ash in the air? Long travel? Or is the marathoner's career like that of an NFL running back? Fabrice Lapierre Jumps Only 17cm Short Of Mike Powell's WR On the other side of the world, Aussie Fabrice Lapierre jumped a wind-aided 8.78m several days ago to become one of the top 6 jumpers of all-time. We wanted to let you know before all of a sudden he breaks Mike Powell's 8.95m world record. Jersey Shore Paper Runs Feature On Robby Andrews Andrews looked like he was out of it on the 4 x 8 anchor before blowing past Wheating on the final straight. The next time the two 800 standouts face off will likely be NCAAs in June ... in Eugene. If you want to watch the Penn 4 x 8 or read our recap of Saturday's biggest moments, click here. It's True: Usain Bolt Brought Penn Relays To A Halt At a meet always run like clockwork, Bolt's celebratory lap took precedence over tradition, schedule. Even his warmup strides caused races to be held up due to crowd noise. The race was billed as a Galen Rupp American record attempt, but Chris Solinsky had something up his sleeve in his 10k debut. Solinsky went to the front with 900m to go and powered home the last 800 in 1:56 to smash the American record and break the magical 27-minute barrier. Rupp? He did get under the old record, running 27:10 for 4th. Sam Chelanga beat Rupp in 27:08 to get the collegiate record by 20 seconds. The Most Unexpected American Distance Performance In ____ Years? In the women's 5k, Shalane Flanagan was way in front but well off of 5k record pace until the final lap when she fell apart and was passed by Shannon Rowbury, who ran a 15:00.51 PR for the win. Good Read: Jeshua Anderson Gunning For 3 Straight NCAA 400 Hurdles Titles Washington State's Anderson gave up football to focus on becoming the best 400 hurdler in NCAA history. Tyson Gay Interview Talks About Sharing Spotlight With Usain Bolt And Plans For 400 People forget how fast Tyson Gay is. How about 9.69, 19.58, 44.89? Tyson Gay Hoping To Break Tommie Smith's 200m Straight Track Record Smith ran the WR on a cinder track, Gay will run in Manchester. Justin Gatlin Return Approaches - USADA CEO Says His Coaches Took Advantage Of Him Gatlin has never admitted to knowingly using any illegal performance enhancers. NY Times Profile On Young American Sprint Hope Ryan Bailey There are some question marks with Bailey. Malawi National Team Arrives For African Championships 3 Months Early Unfortunately, this is not a joke. Malawi leaders failed to get the notice that the African champs were in July, not April. Lineth Chepkurui Hopes To Stay Hot On American Roads At Lilac Bloomsday Red-hot Lineth Chepkurui will go for her 3rd win at Lilac but will have World XC champ Emily Chebet as top competition. Ridaoune Harroufi is the top male in the men's elite field. Gebrselassie Talks About Running 2:02 LOL. Top Russian Anna Alminova Given 3 Month Ban For Psuedoephedrine Positive At Indoor Worlds In other reports, mid-d star calls positive result a "good lesson," blaming the accident on taking Dynafed Plus. Deena Kastor Explains Her 2:36 In London Cramps, pains, allergies and "just a bad day" left Deena shuffling towards the finish line. Non-Marathon-Related: Joseph Ebuya Wins French 8.8km XC In 23:57 World Cross-Country champion Joseph Ebuya hit the turf running in France to top a quality field in what seems like an incredibly fast time.